Baghara baingan is a popular dish from Hyderabad. 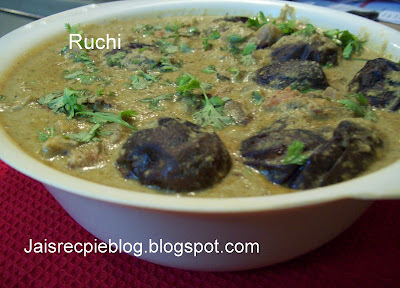 It is rich gravy of coconut, peanuts and spices cooked along with eggplants. The tiny brinjals are fried and then cooked in delicious gravy made with freshly roasted spices ground to a fine paste lending their unique flavor. Sounds good & tasted great too! Wash the brinjals well, and make 2 perpendicular cuts through its base, making a criss-cross, and leaving the head (green stem) intact. Now heat oil in a wok for frying. When it’s ready, drop 2-3 tiny brinjals at a time and deep fry till they turn purplish-grey, and the skin becomes crispy. Remove and keep aside. Roast the sesame seeds, coconut,peanuts, coriander seeds, Grind the ingredients with water to a fine paste and set aside. Heat oil in a pan. Add the green chilli. Ginger,Then add onion fry until brown but not too dark-stirring contently to avoid burning. Add chopped tomato ,turmeric powder,cuminpowder, coriander powder and red chillipowder, and fry for another 5 minutes. Now add the ground paste, little water and bring it to a gravy like consistency and simmer for 10-15 minutes. Now add the fried brinjals to this gravy. Stir gently to allow gravy to penetrate the slits in the brinjals. Cover and cook for another 10 minutes. Garnish with coriander leaves and serve the traditional Hyderabadi Baghara Baingan with rotis, Parathas or Rice. 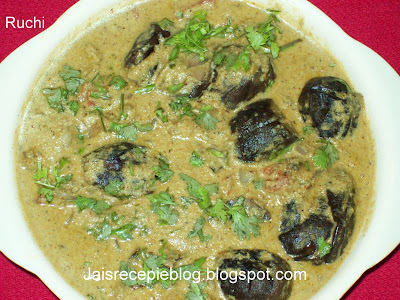 love bagara baingan.my fav.we almost have it twice in a month...i still havnt posted it..
Mouthwatering recipes Jai...lovely n delicious also creamy gravy..
My favorite eggplant dish.. looks yummy! wow, what a delicious gravy! Lovely! that looks yummy! love it!